Many periods of interest to the historical miniatures wargamer can be easily described and immediately understood ("WWII - stop the Axis";"Napoleonics - defeat Napoleon";"ACW - the North versus the South";"Seven Years&apos; War - beat Frederick the Great"; etc.). The same cannot be said of the wars which occurred in Europe during the mid-19th Century. And yet they are connected, and form a coherent period from a wargamer&apos;s perspective. (When I try to summarize it in a few words, the best I can do is "It&apos;s pretty confusing." That doesn&apos;t help.) This site attempts to summarize the period at a level which will make it more approachable to the average historical miniatures wargamer, and to provide links to useful resources. The term "hyphenated wars" as used for the purposes of this site refers to mid-19th Century European conflicts whose names are often hyphenated (Franco-Prussian, Franco-Austrian, etc.). (It does not refer to the conflict over the naming of the Czechoslovakian Republic/Czecho-Slovak Republic, known as the "Hyphen War" - if you found the wrong site by accident, you can click here.) I don&apos;t know who coined the term, but it is used on the HMGS site, so it must be correct, at least for us historical miniatures types. Viewed by some wargamers as a secondary period when compared to such conflicts as the Napoleonic Wars, WWII, or the American Civil War, it remains a fascinating subject which has much to offer the historical gamer. Especially now that we are seeing an increasing number of excellent books in English, it is more accessible to miniatures wargamers than it has ever been. The availability of miniatures for these conflicts continues to grow as well. This site will provide resources pertinent to tabletop simulations of the period. It will cover the Franco-Austrian War of 1859, the Austro-Prussian War of 1866 (aka The Seven Weeks&apos; War), and the Franco-Prussian War of 1870/71, but will also include a number of others: the two Schleswig-Holstein Wars of 1848-1851 and 1864, the various conflicts of the Risorgimento (1848 - 1871), the Hungarian Revolution of 1848, and some other revolutionary conflicts, even though many of these do not have hyphenated names. While historians routinely treat these conflicts as distinct episodes, they are not always easily separated. The Italians refer to the Austro-Prussian War as the Third Italian War of Independence, because, from an Italian perspective, that&apos;s what it is - a part of the Risorgimento. 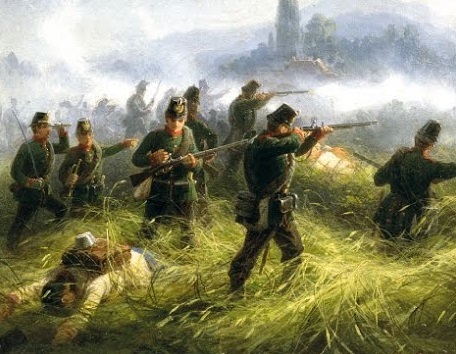 Each of these conflicts had impacts on others: the 1st Schleswig-Holstein War would likely not have occurred if it were not for the wave of Revolutions in 1848 of which several other period wars are a part (the 1st Italian War of Independence, the Hungarian Revolution of 1848, and the 1st Schleswig-Holstein War are all considered to be integral to the Spring of Nations). Because of their inter-connectedness (and because a lot of wargaming figures can do double or triple duty) we will consider them all as within the scope of this effort. Other conflicts, less related to the central theme of this site, will be ruled out of scope, notably the Crimean War and the Carlist Wars. Although occurring during the same period, they were not central to the political and social themes which connect the conflicts mentioned. Similarly, the other conflicts surrounding the Eastern Question are not covered, nor are those of the Polish Question, although these largely took place in Europe - the subject is simply too broad, although fascinating as well. There are many well-known figures who emerged from these conflicts: Garibaldi, Bismark, Napoleon III, Cavour, McMahon, etc. - the list is a long one. But when it comes to hyphenation, the hands-down winner is brought to us courtesy of the 1st Schleswig-Holstein War: Prince Frederick of Schleswig-Holstein-Sonderborg-Augustenburg-Noer (yes - that&apos;s four hyphens! ), the leader of the Provisional Government of the rebelling duchies in that conflict. Sadly, his importance - when compared to, say, Bismark&apos;s - is strictly nominal. One theme seems to repeat consistently throughout this period of European history: it was an era of transition. Imperial and monarchical forms of government were giving way to ones more republican and nationalist in character, with their mass armies of citizens-in-arms; and the uniforms, weapons, and tactics of the Napoleonic era were in the process of becoming those of WWI and the industrial age. They retained much of their Napoleonic flavor: heavy cavalry still charged across the field, and units still bore their battleflags proudly. The uniforms were still colorful, not having yet been replaced by the more practical ones of a later era, and formations and tactics remain recognizably Napoleonic in their foundations. But these relicts of the past were up against technological changes that would finish them: repeating and bolt-action rifles, machine guns, efficient breech-loading artillery, rail transport, etc. This transition involved experimentation with new tactical approaches, making the period not only a very colorful one on the tabletop, but also a fascinating one from the perspective of rules design and simulation. Many aspects of the Hyphenated Wars will be familiar to gamers from the American Civil War. Just as the United States became a republic in the 18th century, and got rid of its king early on, so it abandoned the traditions and theories held dear by the professional militaries of Europe. When time came for the American Civil War, it was to Europe that eyes turned for everything from drill to uniforms to weapons. Yet while the similarities are there, they are far from absolute. You may end up using Fire & Fury for your hyphenated battles, but not without significant modification. And many gamers may be surprised to find how many conflicts suitable to the wargames table occurred in the mid-19th century in Europe. The period is both broad and appealing.